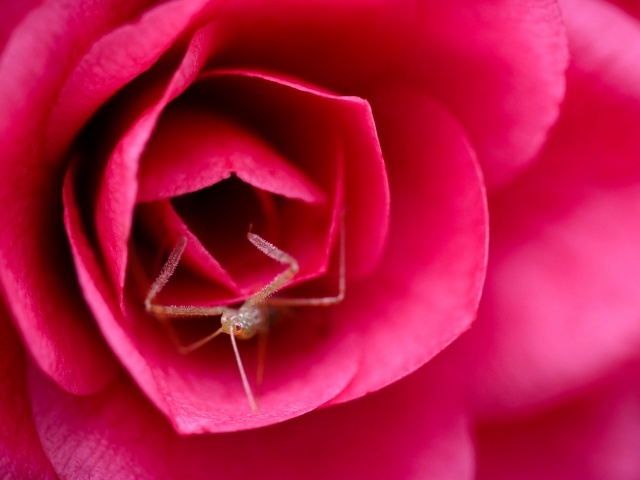 Congratulations to our Top Pic of the Week, Jen Golay! 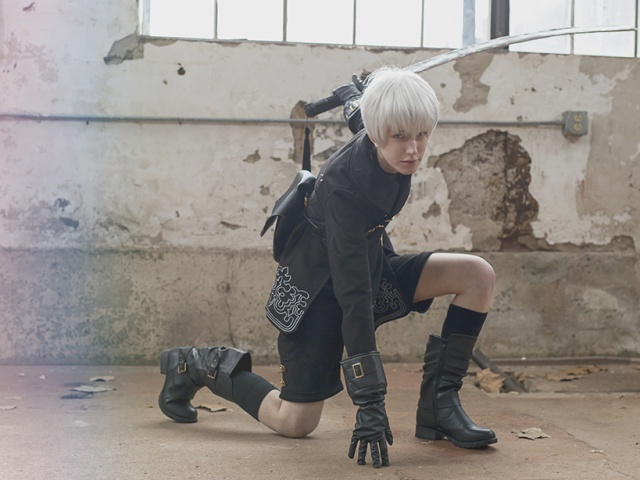 Jen enjoys shooting film photography and experimenting with different cameras and subjects. Read on to learn more about the production of these film photos. I’ve been a photographer since 2004 when I bought my first DSLR with the goal of learning photography and getting “good enough to shoot film.” Looking back now, I am really not sure what I meant by that—maybe just being able to make a well-exposed, in-focus image. I’m not sure I ever got “good enough”, but in 2012 when I was feeling bored with digital photography, I bought a little Nikon FM and enrolled in a darkroom class, and I have never been bored with film photography! I think what I love most about film photography is the process and how present and in the moment it enables me to be. I am very picky about what I see in the viewfinder before I push the shutter button, not just because it costs money every time I do, but because I only have a limited number of shots per roll of film, and I want to make each one count. So I really pay attention to what I see. I notice more things when I have a film camera in my hands, and I trust my vision and that I got the shot I wanted. I still shoot digitally, and I believe that digital cameras are a tool, the same as film cameras, and I always try to choose the right tool for the job. But when I do use a digital camera, I tend to be distracted by the image in the LCD screen instead of the moment I am in. I also just don’t like spending time in front of the computer, and film frees me up to be out shooting instead of editing. My all-time favorite film camera is my Rolleiflex 2.8f. I love how I see the world through the waist level viewfinder, and I love how that camera introduces me to the most interesting people. When I take that camera on a photo walk or when I travel, people often notice it and stop me to ask questions about it or to tell me that someone in their family used to own one. I’ve turned this into a personal project called Roaming Rollei. When someone strikes up a conversation with me about my camera, I often ask them for a portrait. I have many fun memories and stories about the people I’ve met through my Rollei. I love personal work. For me, personal work is often a personal challenge. Maybe I want to master a new camera or a new technique. Maybe I am trying to stretch myself creatively, or maybe I am trying to pull myself out of a creative slump. 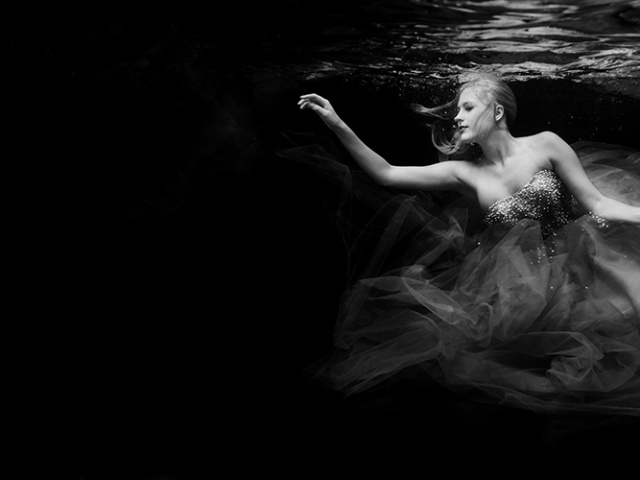 No matter what, I think personal work is where you will find your voice, your style, your passion. It’s an opportunity to make work you love. It’s an opportunity to fail. And it’s an opportunity to learn and grow. Last summer, I was in a serious photography slump. I took an online class for some inspiration, and then I went out and tried new things with no expectations of success. Some of the things I tried were dreadful! But some were pleasant surprises! 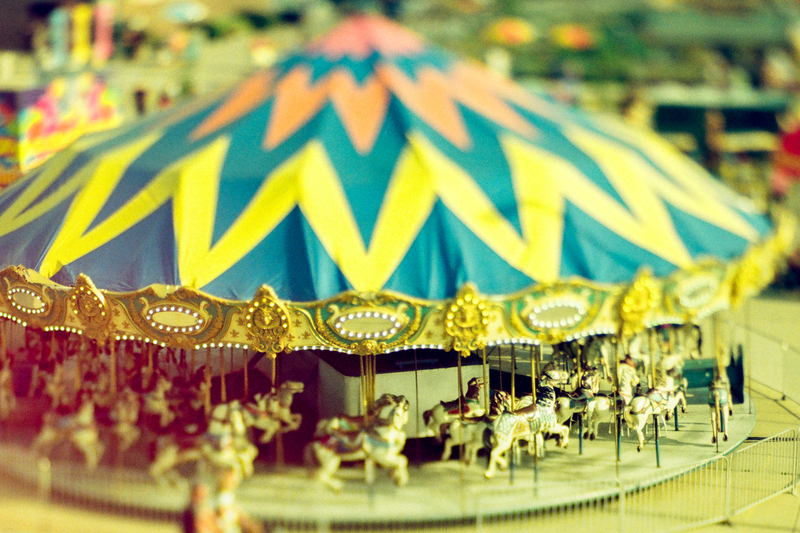 The first image called Toy Carousel was made last August at the Iowa State Fair. I was in a creative slump, so I was looking for ways to stretch myself. I tried a new-to-me film—Revolog Kolor 200—and my Lensbaby Edge 80 and Edge 50 with my Nikon F100 on a trip to the Iowa State Fair. I think I rode the Sky Glider six times so I could play with the tilt-shift effects of this lens! I love how it makes the midway look like a miniature dream from the past. 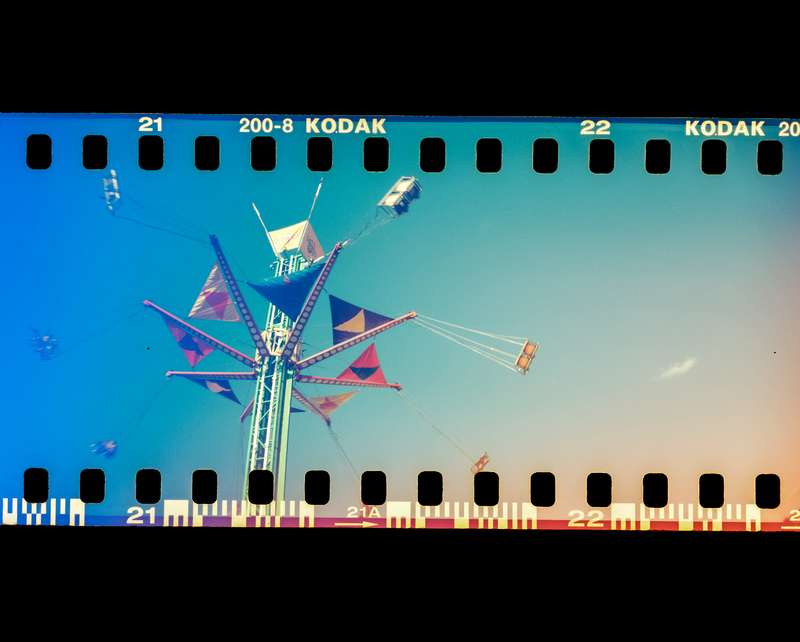 The second image called Swings and Sprockets was also made during my visit to the Iowa State Fair. I bought a toy camera called a Sprocket Rocket to help me experiment and try new, creative things, and I love the panoramic images it creates while including the film sprockets in the exposure. This camera forces you to let go and just see what happens because there are only two exposure options—sunny or cloudy—and two focus options—up close or far away! You really never know what you're going to get when you use a toy camera! This film is also Revolog Kolor 200, and I love the vintage feeling it creates. The third image called In a Whirl was another self-challenge to try new things. 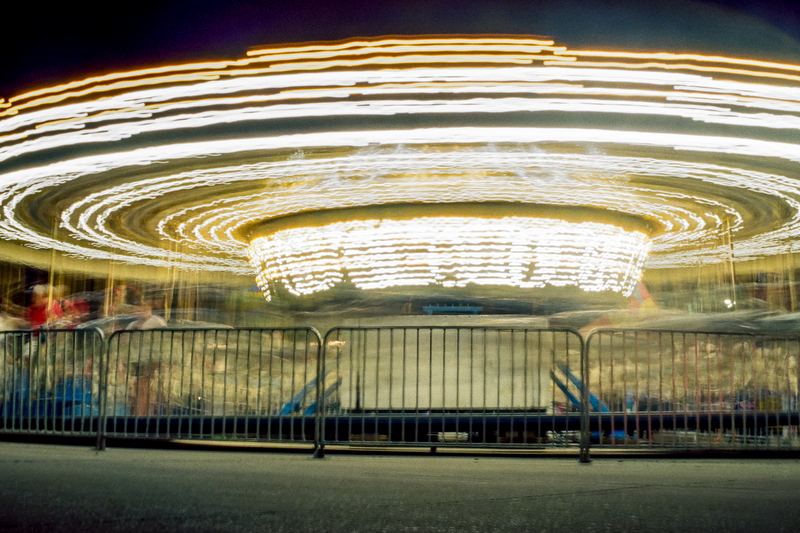 I have always wanted to try a long exposure with light trails on film, so I brought my Gorillapod with me to the fair and set up my camera on the ground just in front of the carousel. I used the timer on my Nikon f100 to make the 30 second exposure on Lomo 400 film pushed one stop so I wouldn't shake it when I pushed the shutter button. The blur makes it feel like the carousel was flying around and around even though it wasn't! 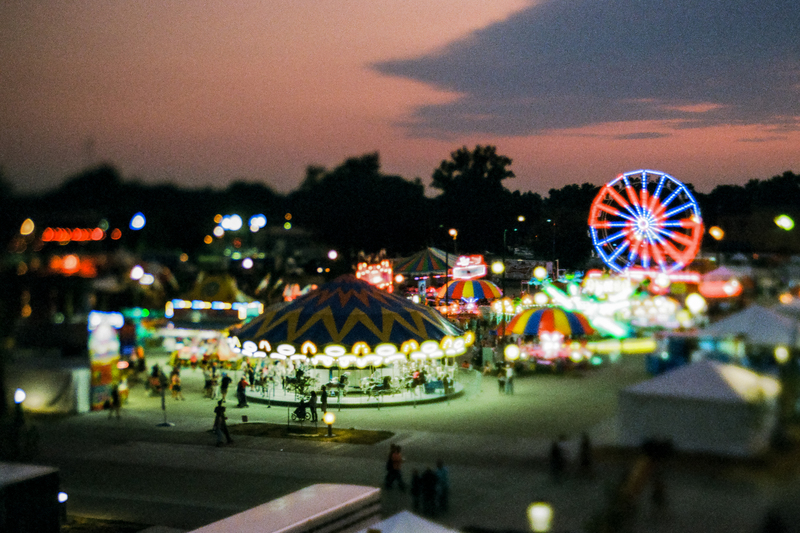 The fourth image called The Midway at Night was made on my last trip on the Sky Glider with my Nikon f100 with Lomo 400 film pushed one stop and the Lensbaby Edge 50. Again, this was a challenge to myself to try capturing an image of the Midway lights on film. For some reason, I had it in my head that there just wouldn't be enough light to capture something like this on film, but I wanted to try. I was very pleasantly surprised by the results! Thank you, Jen, for allowing us to share these photos! Check out more of her photography on her website and on Instagram at @jengolay.